Mehmet Ertüzün collected newspapers clippings about the fate of Leopards in his country already as a young student, never accepting that Panthera Pardus Tulliana may have been exterminated in Anatolia. Later he published articles in outdoor periodicals, where he strongly fought for the idea that hunting Leopards should be totally banned and the subspecies P.p. tulliana be regarded as extinct. In 2006, Mehmet together with his friend Yalçin Ergir have documented the saga of the last Anatolian Leopard. Photos are by their courtesy. In Neolithic times Anatolia was a centre of advanced culture, where Leopards had a cult status and were artfully depicted in murals and reliefs that have been excavated south-east of Konya in the settlement of Çatalhöyük, which dates back to 7500-5700 BC. In Roman times Leopards and other big cats were trapped and pitted against gladiators in arenas and circuses. Today, remnants of special stone traps can still be found in the Taurus Mountains. The Roman politician and philosopher Marcus Tullius Cicero was the first who gathered information about Leopards in Asia Minor in the first century BC. To him the French zoologist M. A. Valenciennes dedicated the scientific name Felis Tulliana, when he described the Anatolian Leopard in 1856. Known as "Anadolu Parsi" Leopards inhabited the entire Aegean region of Turkey as well as the Southeast and East Anatolian regions. 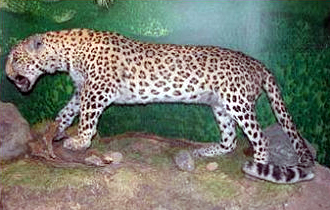 Records of the beginning of the 20th century indicate the presence of Leopards in the southernmost Hatay Province, along the entire Taurus and Köroğlu mountain ranges to the northwest coastal area of the Black Sea. Throughout the 20th century numerous Leopards were caught in tiger-traps and relentlessly killed by buckshots. After World War I hunting Leopards for trophy was a favourite pastime in Turkey. The first hunting regulation announced in May 1937 classified Leopards and tigers as hazardous animals and allowed killing them at all times. Hunters proudly posed with their pelts and dead bodies for cameras. Hasan Bele made his mark having killed 15 Leopards between 1930 and 1950. Known as Mantolu Hasan, the “Robed Hasan”, he draped the pelts of his kills over his shoulders like pelerines. His ruthless killing only ended when İsmet İnönü, then President of the Republic of Turkey, awarded him a new shotgun on the strict condition that under no circumstances he should attempt to aim his gun at a Leopard any more. In February 1967 Ali Çalayır shot a Leopard near Seben, a village in the area of Ankara-Bolu. In January 1969 a peasant poisoned a Leopard near Samandağ in Hatay Province after the Leopard had killed his donkey. The peasant baited the big cat with the donkey’s carcass, on which he had smeared poison. In 1970 a Leopard was shot at Karakale in Kars Province. Only a few scattered records of Leopards remain in the early 1970s: one Leopard was sighted near Çatacık village of Mihalıççık, one near Eskişehir, both in central Turkey, and one more near Ararat mountain in Eastern Anatolia. The last official record of a Leopard is dated to 17 January 1974. Bağözü village of Beypazarı, northwest of Ankara. On the morning of this day, Havva Köksal walked down the village path towards the fields for picking some vegetables. Her husband and father-in-law had already disappeared beneath the hillside ahead of her. Havva remembers: "At the side of the path was a somewhat very long-tailed creature. The very moment I spotted it and decided to move backwards it flew like a bird and landed on me, held my arm and shook me. When I opened my eyes, there it was sitting in a dog-like posture. Then I have lost my consciousness again." The Leopard had grabbed Havva’s arm with its strong jaws and shook her body to and fro. Neighbors heard the noises and rushed by, chasing the Leopard off. But soon after this incident armed villagers started searching for the "spotted beast", of which Havva remarked: "It was awesome, clean, I mean so beautiful, there was no dirt on it. It was lot different when alive." Ahmet Çalışkan, an experienced hunter, wounded the Beypazarı Leopard and then shot him with 8 bullets from his Mauser rifle. When the Leopard tumbled and fell right on its chest Ahmet still did not know what on earth this spotted animal was. The carcass was taken to the Beypazarı State Hospital. The town council’s loudspeakers announced the arrival of a strange big cat, and soon curious crowds came to see and touch the Leopard against a charge of 2 Turkish Liras for hospital aid. With the collected money the hospital later purchased a brand new x-ray equipment. One of the hospital’s physicians claimed the Leopard to be the hospital’s property, wanting the coat for his wife. When the Bağözü villagers raised a hue and cry the physician threatened to quarantine everybody for rabies. While the angry villagers headed to meet officials for questioning, the Leopard was taken to the Veterinary Bacteriology Institute in Ankara for a brain tissue check, which proved negative for rabies. Finally the Bağözü villagers received 4,000 Turkish Liras from the Ankara-based General Directorate of Mineral Research and Exploration (MTA), which they eventually used to build a cottage as residence for the village imam. The Leopard’s skin was preserved with borax, its carcass buried somewhere in the MTA premises for future use. But later on the exact location of this site was not retrieved, and a new building erected in the area. A pair of glass eyes was not easy to obtain in those days, but MTA staff Ergun Kaptan would not give up until he got hold of a pair of glass Leopard eyes from a forestry engineer. However, one of the eyes got lost rolling under a lavatory unit. For many years the stuffed animal was stashed away in the dark basement gallery of the MTA Natural History Museum, and only in 2003 was moved to a more appropriate location in the new museum building, where it is still displayed today.